The outrage over Pepsi’s “short film” with Kendall Jenner seems misguided. From the articles I’ve read, the outrage appears to be focused on the scene where Kendall Jenner offers a police officer a Pepsi. 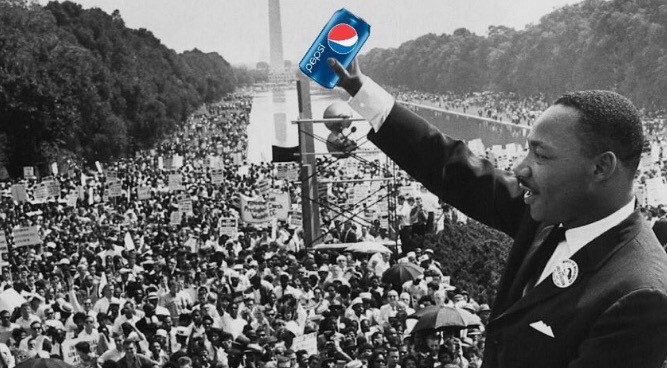 Despite the enraged voices and satirical responses, Pepsi doesn’t appear to have been suggesting that its fizzy soda is a talisman that will prevent police brutality. The ad never indicated that the police were on the verge of revealing themselves as jack-booted thugs about to steamroll the dreamy-eyed marchers. In its ad, Pepsi merely showed a diversity of people supporting one another. The offering of soda to the police officer appeared as nothing more than an act of kindness. Yes, Pepsi is employing such imagery in pursuit of its crass commercial interests. That’s a far cry though from exploiting or mocking a serious social justice movement like Black Lives Matter. This account struck me as a prime example of what racism is all about: the denial of a person’s common humanity based on the color of his or her skin. What is more human than a child’s desire to show a parent up close and personally what she can do with the training and education she has been given? Although Simone didn’t say so, I can imagine that her parents too were disappointed and frustrated when they were expected to sit on the back row. What parent would not want to sit closer to their child in a position more fitting for someone whose child was performing? And how dehumanizing is it to deny a child or her parents such opportunities solely on the basis of skin color and racial privilege? However, Simone’s account illustrates the foundation which leads not only to minor slights but also to the more visceral forms of racial discrimination and injustice: the fundamental denial of the basic humanity of another person or persons who are different from us. If we could only see that we are all humans with the same types of concerns, dreams, and desires, we would not let a superficial difference like skin color lead us to deny others what we are so protective of in ourselves. Author micDroprPosted on March 31, 2017 Categories Humanity, Race, Race in America, Racism Matters, Racism Must DieTags Humanity, Race, racismLeave a comment on Item! Racism Matters!